Bohnsack Big Oak Farm is a family farm/ 4-H project that started in 1993 and has grown as our hobby has gotten out of control. The farm is owned by Jay and Sarah Bohnsack and is located in Taylor Ridge, IL. The farm help is Arika, Josh, Jordan, Jake, Kameron and Keegan. In 2009, Jay was proudly elected to the Illinois Polled Hereford Associaion Board of Directors. Also in 2009, Jay was elected as Andalusia Township Clerk. We currently raise Hereford cattle, market lambs, tea-cup yorkies, occasionally a pig, a llama (tina) and crops. Most recently we have diversified our farming to include mums, tomatoes, several varieties of peppers, herbs, sweet corn and pop corn. We also have quality beef for sale by the cut, package, quarter, halves or whole. 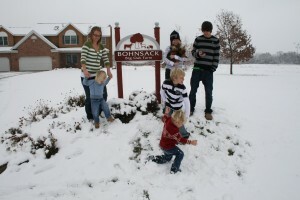 You can also visit our family website at http://www.bohnsack.net or stop by the farm for a real tour! We get our business cards here!